Sorry so late with this--the most recent Disability Blog Carnival, #57, appeared at Jodie's Reimer Reason Blog on June 10. Because participation (like blogging in general) has been down significantly in recent months, the next one will appear on August 13, hosted by Laura at Touched by an Alien: Life as I Know It, with the theme "Relationships and Disability." The blogcarnival.com form is here, or you can leave links in comments here, or just put "Disability Blog Carnival" in the title or text of your post--I usually find those too. Women take care of children, spouses, parents, family members, friends. We dominate the caregiving professions, like nursing or social work. Ask anyone receiving care of any kind and he or she will most likely tell you that the primary caregiver is a woman. Caregiving is a huge part of women’s lives, and so often it’s a job for which we usually don’t get or expect monetary compensation. How can caregiving be made easier to make our lives easier? Over the next couple of weeks, Fem2.0 is partnering with the National Family Caregivers Association, the Christopher and Dana Reeve Foundation, and the American College of Nurse-Midwives to start a fresh discussion about caregiving and women. What is caregiving in all its shapes and forms? What role does it play in women’s lives? What can be done, or what changes need to happen, to facilitate caregiving? We are looking for insights, comments, and expertise. We are looking for personal stories to illustrate the human experience of caregiving and to build a sense of solidarity among all caregivers. 1. Blog about it at your own site by July 13, and send Fem2.0 the link, so they can add your post to the blog carnival on Fem2.0. Alternatively you can write a piece for the Fem2.0 blog and send it to info@fem2pt0.com. 2. Participate in the Women and Caregiving Twittercast Monday, July 13, at 10 p.m. (EST) — hashtag #fem2. Find out how to join a Twittercast here. 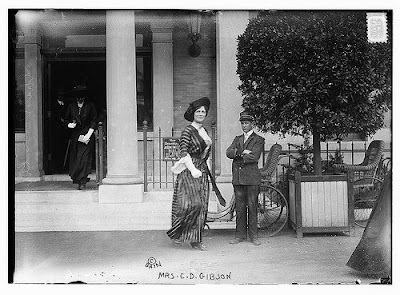 Another fin-de-siecle matron in a wheeled chair turned up in the Flickr Commons today, this time in the uploads from the Bibliotheque de Toulouse. 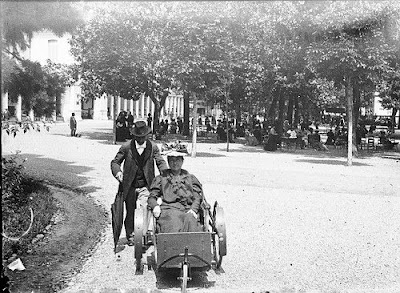 Above, a black-and-white photograph shows a man standing behind a woman using a three-wheeled chair, in an outdoor setting we're told is Luchon, on 9 July 1899. Luchon was a spa town in the French Pyrenees--still is. Who was Madame Gardriol? It's probably safe to assume she was a summer visitor to the springs. 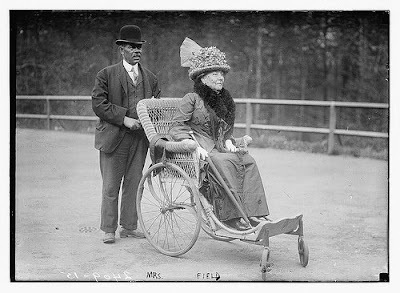 Was she someone who used a wheelchair ordinarily, or was this day in 1899 (perhaps like Mrs. Field's photo, in an earlier DS,TU post) a special occasion of touring, for which she chose wheels? Mme Gardriol's chair looks a bit sturdier than the wicker at the Bronx Zoo--hard to tell from this angle, though. The man is holding a parasol--is it for himself, or an additional accommodation for Mme. Gardriol's health and comfort? Anyone have more insight into the Luchon wheelchair accommodations in 1899? So, the photo above (from the Library of Congress uploads to Flickr Commons, from the Bain Collection of news photos taken 1910-1915) depicts Mrs. Field, obviously a well-to-do matron, in what appears to be a wicker wheeled chair, pushed along an outdoor path by an older African-American man in a suit and bowler hat. Was Mrs. Field a wheelchair user? The woman hurrying past the camera is Mrs. Charles Dana Gibson (of Gibson Girl fame), but look behind her, to the right--chairs like Mrs. Field's, two of them, unoccupied, lined up, with a uniformed attendant nearby. What does the sign say behind Mrs. Gibson? "New York Zoological ...Administrative Building No Admittance" and some smaller print. The Bronx Zoo was called the New York Zoological Park at this time. So, we're at the zoo, and those chairs are apparently available (as a courtesy? as a rental?) for zoo visitors. Much like some zoos and amusement parks have available today. Hmmm! Were the pathways at the zoo made to accommodate these conveyances? Mrs. Field obviously didn't mind being photographed on wheels during her visit--no stigma? Or, no stigma if it's perceived as a luxury rather than a necessity? Did other zoos and parks have such provisions in the 1910s? When did this trend start? What happened to these chairs? Were any smooth paths reconfigured with steps after the chairs went into disuse--in other words, did a wheelable zoo become less accessible for a time? Would love to know more about the Bronx Zoo wheelchairs of the 1910s. Anyone?